The users of hazardous materials at the University have historically had a good safety record. Sound safety programs, a controlled environment allowing ready access to the general site and the product, good equipment, a tested quick response capability and well-drilled personnel have contributed to this excellent record. However, incidents can occur in even the safest environment and an absence or breakdown of any of the above safeguards could result in a major emergency. User incidents may result from equipment failure, human error, failure to follow established procedures, natural disaster, or sabotage. The UW utilizes a computerized inventory system called “MyChem” and manufacturer-supplied Material Safety Data Sheets (MSDS) which can be used for pre-event planning as well as for response reference in a localized spill or accident. 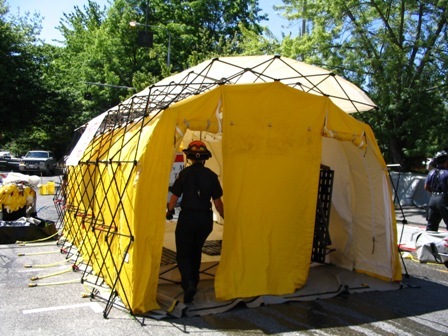 The Seattle Fire Department as well as various Federal, State and UW rules and regulations require that this chemical information be accessible to the entire UW community. More detailed information on these systems and requirements can be found at University’s Environmental Health and Safety Department. A valid UWNetID and password are required to access MyChem MSDSs are available readily to all faculty staff and students. Inventory information is restricted by registration accounts. Move away from the accident scene and help keep others away. Do not walk into or touch any of the spilled substance. Try not to inhale gases, fumes and smoke. If possible, cover mouth with a cloth while leaving the area. Try to stay upstream, uphill and upwind of the accident. In the event of a major chemical emergency, you will be notified by the authorities. To get your attention, a siren could sound, you may be called by telephone, or emergency personnel may drive by and give instructions over a loudspeaker. Officials could even come to your door. Listen carefully to radio or television emergency alert stations (EAS), and strictly follow instructions. Your life could depend on it. Do not call the telephone company, and do not call EMS, 9-1-1, or the operator for information. Dial these numbers only for a possible life-threatening emergency. You can provide a minimal amount of protection to your breathing by covering your mouth and nose with a damp cloth. Authorities may decide to evacuate an area for your protection. Again, it is important to stay calm, listen carefully and follow all instructions. If you are told to evacuate, listen to your radio to make sure the evacuation order applies to you and to understand if you are to evacuate immediately or if you have time to pack some essentials. Do not use your telephone. Return to building only when authorities say it is safe. Clean up and dispose of residue carefully. Follow instructions from emergency officials concerning clean-up methods.